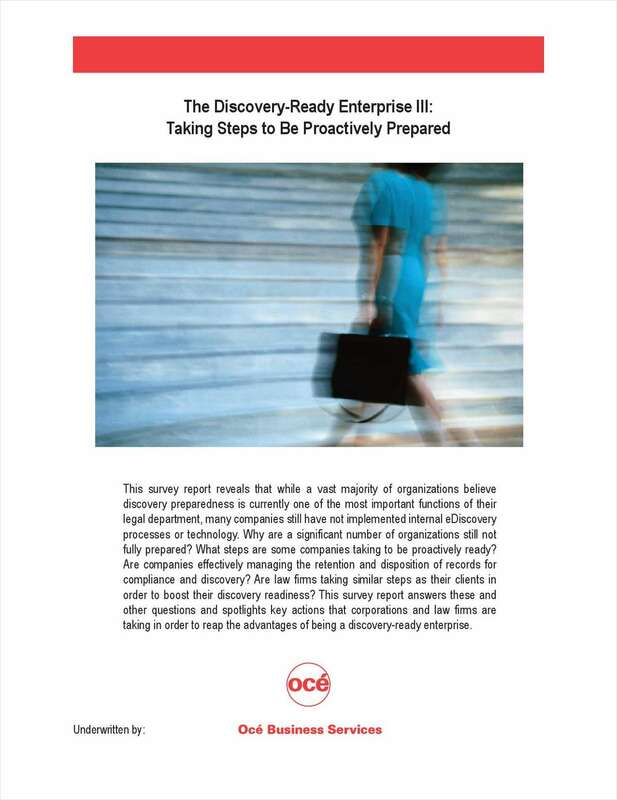 "The Discovery-Ready Enterprise III: Taking Steps to Be Proactively Prepared"
Free Survey Report: "The Discovery-Ready Enterprise III: Taking Steps to Be Proactively Prepared"
This report spotlights key actions that corporations and law firms are taking in order to reap the advantages of being a discovery-ready enterprise. Has your work information changed? Please review the fields below for completeness and accuracy prior to submitting. By submitting this content request, I have legitimate interest in the content and agree that Océ Business Services, their partners, and the creators of any other content I have selected may contact me regarding news, products, and services that may be of interest to me. Valid email address is required to fulfill your request. Complete and verifiable information is required in order to receive this content. We require that you verify your email address prior to updating your account. Simply click on the button below and we'll send a quick note to your primary email address () confirming this request. After you've verified your email address, you can review and edit your account. Copyright © 2019 NetLine Corporation, All Rights Reserved.